Few can argue the power of a father-daughter bond, especially when a simple request can change the course of sporting history. It’s rather unlikely Elizabeth Graham’s father set out to be an innovator when he told his daughter to cover up her face, but that’s exactly what he achieved with one protective command in 1927. Ms. Graham, a star goaltender for the Queen’s University Golden Gaels women’s hockey team, donned a fencing mask to protect herself on the ice, allegedly influenced by recently received dental work. While modern common sense would tell you it’s a good idea to always wear a mask while playing goaltender regardless of the cost of your teeth, it’s a classic example of a current invention created in some part unintentionally. A quick Google Images search for “1920s fencing mask” shows a number of designs, but few that resemble a modern hockey mask. Regardless, any protection is typically better than none, and it’s likely both Ms. Graham and her father felt a little safer wearing the helmet to cover her face. 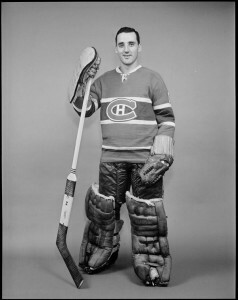 Montreal Canadiens Hall of Fame goaltender Jacques Plante is credited with popularizing use of the mask in the NHL starting in 1959, following a broken nose from New York Rangers forward Andy Bathgate. Many fans are also aware that Clint Benedict of the Montreal Maroons wore a mask in 1930 to cover up a broken nose, becoming the first NHL goaltender to do so, but both of these occurrences fall chronologically behind Graham’s pioneer effort. Each of the three, however, share a common bond- they were ahead of the game in terms of protecting themselves, and all three should be remembered for their contributions to the game. While Graham is inevitably the least-known of the three due to never making it to the NHL, true hockey history aficionados should be made aware of her story. Jacques Plante was perhaps the greatest goaltender of his generation, but it’s likely more people know his name due to his mask. In an article for the Vancouver Sun (available here via the Queen’s University Alumni Review), reporter Stewart Bell (and grandson of Elizabeth Graham) recounts the details of the game where Graham first wore her mask. While hockey was just a part and not the whole of Graham’s life it seems, one action she took stands above all else in importance to the sporting world. As women’s hockey continues to grow around the earth, goalies like Shannon Szabados (who recently suited up in the Southern Professional Hockey League as their first female player) and Noora Raty (who signed a deal with a Finnish men’s team) can look back to Graham as a role model, showing that gender is never a barrier for hockey innovation. Why it took others so long to realize what Elizabeth Graham and her father did (that protecting your face while playing hockey is smart) is very much a mystery, but one thing is for certain- listening to your parents and going to the dentist has the potential to be the catalyst for a very historic event.